The electric resistance between the top point of soldering iron while heated and the earth point of the workshop must not exceed 5.0Ω. The electric potential difference between the earth point of the workshop and the top point of soldering iron while heated must not exceed 2mVRMS. The power supply should use three line code and point earth grounding method. The soldering iron should be designed to have a switch change at 0 voltage. Do not use transformer type soldering iron. How to use the iron tip temperature sensor unit? Please wipe the iron tip lightly with cleaner, and touch censing part softly, putting a small amount of solder on the iron tip. 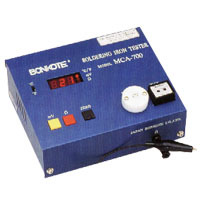 Temperature, leak voltage, and earth line resistance can all be measured by this equipment. It is not necessary to calculate, you only have to read the digital display. It is possible to exchange the Sensor speedily by one-touch plug-in method. Management according to ISO-9000, QS-9000, and MIL is possible.